ADOPTED: I have found my forever home!! I have 2 4-legged sibings and I have a brother, plus my mom & dad I can't wait to snuggle with them!! Life is great!!!! My new mom & brother!! Life is going to be Wonderful, as long as they don't take a lot of pictures!!! Ulysses & I were dumped on a rural country road in Rowan County KY. 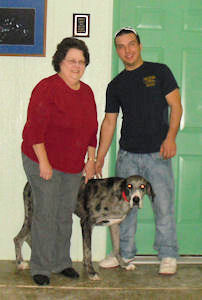 The man that found us was unable to locate our owners so he took us to the already overcrowded county animal shelter. Unfortunately he had kept us long enough that we were considered owner surrenders and that meant we could be euthanized immediately for space. 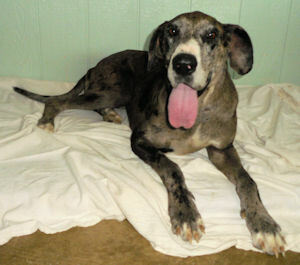 Lucky for us a rescue called STAR that works with the county animal shelter pulled us hoping to find a Great Dane rescue that could take us. 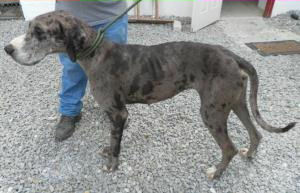 Then our luck turned bad again when the Dane rescue that had said they would take us backed out because we were too skinny!!! But the volunteers of STAR did not quit they immediately started contacting other rescues and when they contacted Harlequin Haven they agreed to take us immediately!!! Plus the great volunteers with STAR even transported us to HHGDR the very next day!!! We are now safe and we are enjoying the food, soft beds, toys and especially the air-conditioning!!! No dog should be living outside in these 90 - 100 degree temperatures!! We are being fed several small meals a day because we are very skinny!! 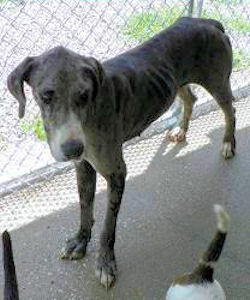 We are very happy and loving Danes and we greatly appreciate all that has been done to save our lives!! I am a bit shy but I warm up very quickly and just love getting hugs and kisses!! I weigh only 84.5 pounds and I should weigh about 100 pounds so I have some eating to do!! Update July 8: Life is wonderful!! I now weight 93 pounds and already have my spay appointment scheduled!! I am feeling great and just can not get enough play time!! Although I am still shy I am not as bad as I was a week ago! Update July 22: Well my spay appointment was canceled!! I went into heat and now have to wait till I am out of heat to be spayed!! Grandma says it will only be a few more weeks, I can't wait!! I do have a favorite toy that I just love to play with unfortunately I destroy 1 every few weeks!! It is called a Hard Boiled Softie and is made by Kyjen and Grandma says I gotta stop squeaking them so much cause when we run out that will be it but I don't like the other toys as much! Would you like to buy me one??? Update August 5: I had a really great surprise when I got home from the vets office after being spayed. I had 3 brand new Hard Boiled Softie's waiting just for me!! Thank You Jo!!! OOPS I am NOW ready for adoption!! Above pictures are courtesy of STAR.